ADE Cagomoc presides over the coordination meeting with contractors at the DPWH Conference Room. 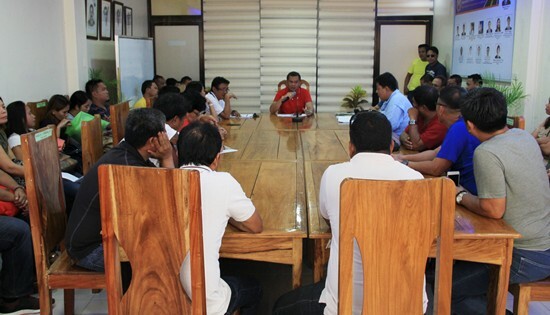 CALBAYOG CITY – The Department of Public Works and Highways -Samar First District Engineering Office holds a coordination meeting with contractors on July 6, 2018 to discuss the implications of the present administration’s Budget Reform Program of 2019 to the implementation of the District’s infrastructure projects. In the absence of District Engineer Alvin Ignacio, Assistant District Engineer (ADE) Denis Cagomoc meets with the contractors informing them that the District has received instructions from Sec. Villar, ordering contractors to finish all infrastructure projects on or before December 31, 2018. This is in light of the government’s push to shift the budget from an obligation-based system to a cash-based one. With this transition, all remaining funds for the year will expire; giving the District until December 31, 2018 to settle all payables. There will be a 3-month payment extension period on January to March 2019 but only for projects with 100% accomplishment as of December 31, 2018. Failure to complete the project before year-end will result to rescission of contract and blacklisting of the contractors’ license. “We only have less than 6 months to finish all of our infrastructure projects. If we do not meet this target, all of us will be affected. Our funding may be reduced, hindering the development of the District as a whole. If you have to work day and night, if you have to hire more men, do it. Do whatever is necessary to speed up project implementation,” said ADE Cagomoc to the contractors.